In a job interview, the perfect time to ask your questions to get to know more about the company and the job in detail, is when at the end of the interview the interviewer ask you if you have any questions. 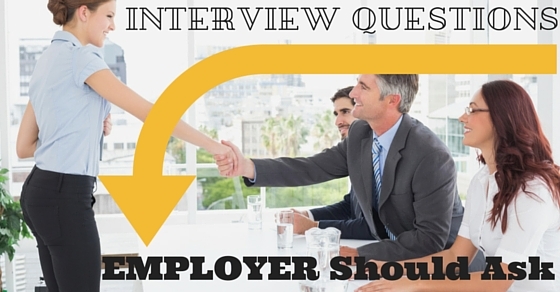 The questions that you pose should be at the same time evaluated the company and the job profile as well. Because, the job that you are going for will lead to a long term relationship and will have a direct impact on your life. So it essential to ask to the interviewer some questions of these types to find out if the job and the company makes a good match for you. In the list below, we provide you with the top 10 questions to ask in an interview. Posing some quality questions also gives you a good opportunity to let your interviewer know about your interest in the job and the company, and marks a good impression on you to the interviewer. This question lets you know in detail the job responsibilities like whom you should be reporting to, what kind of responsibilities you will have in the job and such other details. How would you describe a typical day or week on the job? The interviewer will let you know the job and office environment, any shift timings, amenities that they provide, and other such details. These details will let you prepare for the job as this a new environment for you. This question will help you in finding out if this is a relatively new position that the company has introduced or whether it is an already existing position and you are filling the requirement for the company. The management hierarchy of the company like who is leading who and what kind of influence the management will have on their employees and their work. You would be willing to know the career growth that the company facilitates for you, so that you can evaluate your skills and expertise and their growth and development in the job environment. You can provide you references list, if the interviewer asks you to, which helps you in exhibiting the credibility that your references have on you. With this information, you can prepare yourself to get ready to join the job by the time the company requires you to be available, or you can ask them to change the joining date to suit your requirements. What else can I tell you about my qualifications? This lets you to complete revealing all the job qualifications that you have, if the interviewer has missed anything from you. To find out the result of the job interview and also to find out if there are any further procedures involved in evaluating you for the job. This is the last question for you to ask the interviewer and this helps the interviewer in reviewing himself whether he has covered all the questions that need to be asked. « Top 10 Scams Online that you may fall for, Beware!